Sunday night in Kansas City marked the opening night of Drake and Migos's headline tour. After a few delays, the "Aubrey and the Three Amigos Tour" kicked off with all-new merch as well as a floating Ferrari. The set included moments where both acts came together, including a first ever live performance of "Versace" as well as 2018 hit "Walk It Talk It." 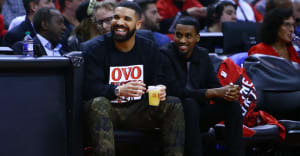 Naturally, Drake performed many Scorpion tracks for the first time as well as throwing a cover of Michael Jackson's "Rock With You" into his set. Jackson's posthumous vocals appear on Drake's Scorpion track "Don't Matter To Me." Check out some highlights, plus a full setlist, from the Kansas City show below.